THE TRUTH ABOUT URI GELLER. Interlocutor: . 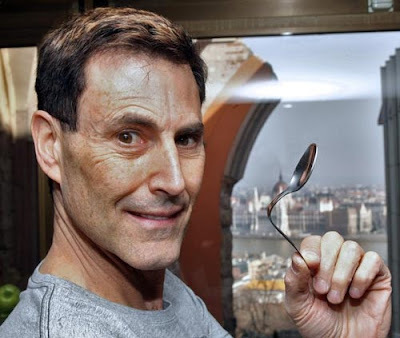 Now I’ll move on to another topic in which I’m truly very intrigued, it is the case of Uri Geller. I asked you about this topic some years ago and you told me that he was a fraud, but in that moment I didn't deepen in the topic, and as one commonly says, "I left it on the desk." The intrigue comes that no matter how big a fraud is, there are witnesses, even scientists of very well-known universities that have investigated him and that they vouch for his abilities - I don't say powers, because I know that in the physical plane nobody has powers, but gifts- To have influence over metals and other objects. Particularly he became famous when he bent teaspoons "with the mind." Interlocutor: And the spirits of the error? Ron Hubbard: They can produce that effect in the physical plane making focus. But this doesn't have anything to do with powers nor miracles, because they don't exist. The physical plane has laws that cannot be destroyed and among of those laws, there is a law that says that teaspoons cannot be bent with the mind. Concretely, Uri Geller works with the spirits of error. Interlocutor: But he believes he has some power? R on Hubbard: As any person would believe it. Interlocutor: But Is he aware that he is being helped by the spirits of the error? Ron Hubbard: On the contrary, he thinks that he is being helped by beings of Light. Interlocutor: In synthesis, Uri Geller believes, on one hand, that he has powers, and on the other hand that beings of Light are helping him. Is that correct? Ron Hubbard: Exactly. The Masters of Light do not have part in circus shows because these shows have nothing to do with the Service. Interlocutor: Are you telling me that in every show that Uri Geller presents there are spirits of error making focus so that the teaspoons bend and the clocks with broken springs or without batteries work? Interlocutor: And were they also helping him during the researches made on him in the most famous universities? Ron Hubbard: Uri Geller is “The Pied Piper of Hamelin" of the spirits of the error!! Interlocutor: Master, I have to admit that you are a genius of Wisdom and humor, because there is nothing better than characterize Uri Geller in that way so that everyone understands clearly what is hidden behind his "prowesses." I remember that a while ago I read in the newspaper about this legendary character that made that all the mice of the Kingdom followed him with his magic flute so that they drowned in the water. Undoubtedly, later on they didn't pay him and in retaliation, he took the children of the town in the same way he did with the mice. I want to clarify for the record that I already asked you in a session if there was something of truth about this and you told me that it was an invented story and that the fact was never real. Ron Hubbard: I ratify it. Interlocutor: Well, I believe that it is a very suggestive title and I will use it: "Uri Geller, The Pied Piper of Hamelín." Ron Hubbard: It is valid, and you can do it because it gives a precise idea that this person is followed by the spirits of error wherever he goes. Interlocutor: He doesn’t know it? Ron Hubbard: Of course, he doesn’t know it. Interlocutor: Are the spirits of error still following him? Ron Hubbard: While the person is incarnated and he gives place, the spirits of error will follow him like flies to the candy to take advantage of his ingenuousness and of those who believe in his powers. Interlocutor: Synthesizing this matter to see if I understood well, Uri Geller believes that he has some type of power over the matter and that he is also helped by spirits of Light. Interlocutor: But he doesn't say that he is helped by somebody, although he also speaks about God and extraterrestrials. Ron Hubbard: He doesn't say it because when affirming he has powers the whole issue becomes more attractive to the audience, ignorant that such powers don't exist, and of course to make business. Interlocutor: To what extent can the spirits of error influence in the physical plane making focus? Ron Hubbard: They can influence a lot, and if one doesn't achieve it alone, then a lot of spirits join and do it. Interlocutor: Uri Geller, in front of witnesses, stopped a funicular. Apparently the electric connection jumped off and the apparatus stopped. Ron Hubbard: That can be made perfectly by the spirits of error making focus, but dozens of spirits would have to join. But they also have their limitations. For example, they cannot make work a broken clock and without batteries. Interlocutor: But there are witnesses who say that that happened! Ron Hubbard: There are many frauds and also a lot of collective hysteria in these things. People see what they want to see. Interlocutor: But could the spirits of Error, joining several, make work a clock without batteries? Ron Hubbard: Yes, they can do it through the focused energy. But to keep a clock working without batteries, it is nonsense. Something like that is absolutely impossible. Interlocutor: But concretely they can make a clock work. Ron Hubbard: Yes, but not permanently. They can make it work in the few seconds they make focus, but nothing else. The spirits of Error don't spend the whole time making focus in broken clocks or without batteries so that they work. Interlocutor: I understood the point perfectly. For all that you exposed, I suppose that the spirits of error could stop the Big Ben, the famous clock of London, and make Uri Geller, the researchers and the public believe that the cause was his "power"
Interlocutor: To conclude this matter, Does Uri Geller have some ability or gift, although minimum? Ron Hubbard: No, he doesn't have any ability, he doesn’t have any knowledge and he doesn’t even have wisdom. Ron Hubbard: No, because the person who is devoted to make physical demonstrations without investigating the nature of the spirits and the spiritual Kingdom, the person who doesn’t worry about Spiritual growth or Spiritual elevation and who doesn’t give messages at all. He is not different from the illusionist David Copperfield. Interlocutor: Is David Copperfield also helped by the spirits of error or not? Ron Hubbard: Obviously yes, but in most of the cases they are very well prepared tricks. Interlocutor: Does he also fall into the trap like Uri Geller believing he has powers? Ron Hubbard: Not only he believes he has powers but also that he is being helped by spirits of Light. But this is something obvious. Due to his Ego, the incarnated spirit will never admit that he is being assisted by spirits of error. Who would admit it? Interlocutor: Nobody, obviously. This is clear. Ron Hubbard: In the battles of the past, when an army won a battle, the first thing they said was that the gods had helped them. They never said that they had been helped by demons. Interlocutor: Here, in Argentina, there was also a famous character called Tu Sam who made many audacious shows of fakirs and he even bent teaspoons. Ron Hubbard: He was also helped by the spirits of the error. Interlocutor: But did he know it? Ron Hubbard: No, he didn't know it. Interlocutor: He must have had a great surprise when he disincarnated! Ron Hubbard: Yes, naturally. But I have to say in favor of this spirit that being incarnated he demystified the cheap tricks. He tried to do everything rationally. And he has not lowered of level. At the moment he is in the 4º plane which is a Mastery plane. The spirits of Error have wanted to pull him down but they have not been able to achieve it. We will be honest, not every spirit that embodies has to be a Tibetan monk or be serving or helping at the level of the Mother Teresa. There are many people that make a common life, and as long as they don't damage to their neighbors, everything is fine. There might be artists, professionals, and everyone helps in his way. We cannot take the credit away from a doctor that saves lives and to put on a pedestal a prophet. I keep the lifetime of a doctor or a lawyer that saves an innocent from the jail. The missions that are fulfilled in the physical plane are many and diverse. Not everybody necessarily has to be in the Service of Light for the Light itself. Interlocutor: Will Uri Geller lower of level? Ron Hubbard: Presumably yes, because many things he has done, he did them with malice, but I am nobody to judge him. Interlocutor: All of this was perfectly clarified.